With the treaty with the Danes concluded, Alfred could have taken great pride in his accomplishments and turned his concerns inward, there to help his beloved Wessex and his beloved Britannia flourish and grow, content in the knowledge that the Danes, beaten so badly, would no more threaten Saxon lands. But, knowing that they would sooner die than admit that they were wrong or unable to complete the task for which they had left their homeland, Alfred didn’t trust the Danes, preferring a strong defense and the capability of a strong offense as well. He set about fortifying his newly won lands, turning settlements into forts and cities into garrisons, the more for defense against outside incursion than against civil unrest. Remarkably, the thegns and other soldiers served uniquely in both the army and in their natural capacity as farmers. (This meant that they could be on duty with their weapons for one period of time and then on duty with their farm implements the next.) Also remarkably, settlers got deeds to land in exchange for the promise to fortify and defend them in case the Danes decided to come back. The effect was this: Most of what we now call England was controlled at the center, Alfred’s court. Fanning out in a general form of a wheel were increasing numbers of towns, market places, and forts–all manned and ready to defend their king and their own people’s rights to settle and govern in their own manner, not answerable to some foreign power or people. 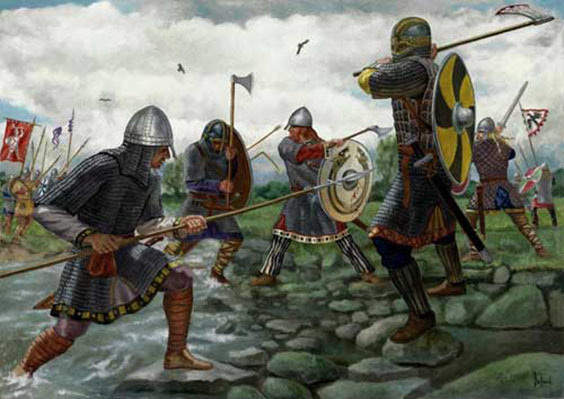 If the Danes probed one part of these defenses, the Saxons would fight back, all the while sending for help to the nearest “outpost,” which would, in turn, send to its nearest outpost (and, likely, send also word to Alfred of the Danish movements). Much like the Romans before him, Alfred could command great forces quickly and move them just as rapidly to wherever they were needed at (in those days the equivalent of) a moment’s notice. It was a military commander’s dream come true: Alfred didn’t even have to leave his court if he didn’t want to. He could depend on his commanders in the “fields” to take care of whatever was needed. Alfred, of course, wasn’t silly enough to attempt that. No, this was a strong-minded king, with a strong will to keep his people protected from repeated invasions. And protect them he did, through a combination of courage, tenacity, and ingenious military planning.